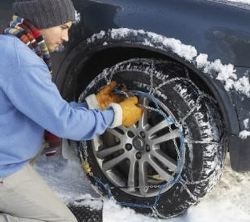 The most essential winter accessories for the motorists. It is much easier and more comfortable to use the car in summer. But winter is coming, and you have a few months to get some nice technological novelties in the area of car accessories, which will make your winter a bit less horrible. The residues of snow and frozen ice on the windshield is a serious obstacle to the comfortable and safe driving. It is impossible to drive using a GPS navigator, without looking at. Therefore, such car accessories as scrapers and windscreen wipers must be at the ready in winter. However, there is a more advanced way to fight the icing. Install the special cover on your windshield to prevent freezing. The frozen lock can prevent you from entering the snowed car to take the scrapers and bland. So, if you often park your car in the street, you should buy yourself a lock defroster. It is not so pleasant to sit in the car in the extreme cold, even with the heating on. And especially, if the equipment of your car doesn’t include the heated seats. But the are some special car accessories intended for this purpose. Removable rugs for the heating of seats is one of the most comfortable car accessories.